Our Ten Key Speed Test is a general indicator of the applicant’s ability to correctly enter and process data in any capacity or environment with the use of a 10 key device. This assessment will allow you to measure Average Words Per Minute (WPM), Average Key Strokes Per Minute (KSPM), Accuracy, and provides a Total Score which compares the individual's scores against 20,000+ others. This assessment is appropriate for most, if not all, entry-level data entry jobs that involves the use of a 10 key device. 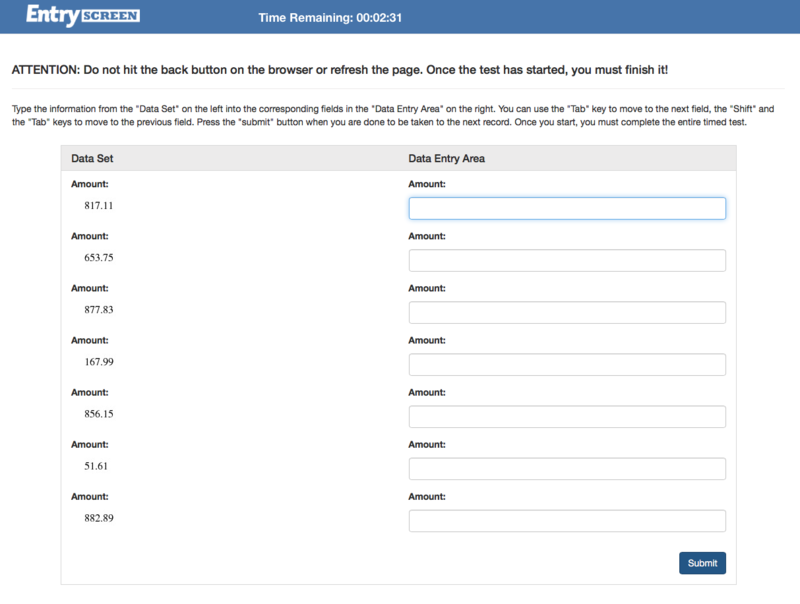 EntryScreen's Ten Key Speed Test can be fully customized with any combination of numbers (decimals, negative/positive numbers, addresses, phone numbers, etc.) or you can upload company specific content to create your assessment. Getting started with EntryScreen is easy! Give us a call at 1.888.633.9269 to set up a Live Demo, discuss Price Quotes, begin your Free Trial, or to Start Testing applicants today! !